Whether you’re seeking pain relief or relaxation, the team at Vitaphysical can help. Based in Sunderland, our clinic is close to Cleadon; from here we offer an extensive range of osteopathy and massage treatments. Our professional musculoskeletal practitioners treat a wide range of conditions, from everyday problems with posture through to chronic back and neck pain. We also work with individuals who have suffered injury or been involved in accidents, delivering treatment programmes that ease pain and improve function. 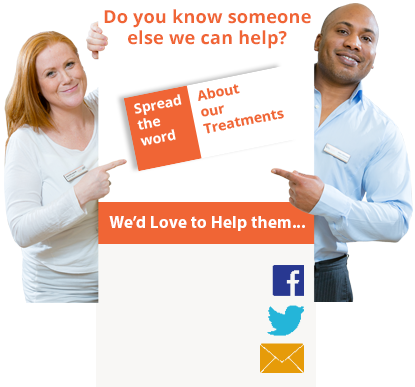 You can view our inclusive range of osteopathy and massage treatments on our what we treat page. If you’re looking for massage treatments in the Cleadon area, our experienced massage therapists offer a range of therapies designed to soothe, relax and restore movement. Massage therapists Bronyia, Emma and Kirsty provide traditional full body massage, deep tissue massage and relaxation massage as well as Thai massage. Sport massage specialist Kirsty also works with pregnant women to ease pregnancy pains and promote relaxation. We’re confident we can successfully treat your body’s aches and pains, which is why we offer a 100% money back guarantee on all courses of treatment. Many of our patients come to us following private or NHS treatment or after visiting a chiropractor and we’re proud to be able to share some of our patient success stories on this site. If you’re unsure which type of treatment is right for you or would like to learn more about what you can expect when you visit us, we recommend you call Jason our osteopath to discuss your case. This allows us to match you with a course of treatment and to guide you through the treatment process. You’ll find discount vouchers redeemable against your first visit available to download from this site and should you want to bring a friend or family member with you to your treatment we are more than happy to accommodate them. You’ll find our John Street clinic just a short walk from Sunderland train station, we’re also easily accessible via the A1018 from Cleadon and we provide free patient parking at our centre for your convenience. You’ll find more information about our location on our contacts page, where you can also get in touch with us via email. We look forward to welcoming you to our clinic soon.